san diego – Page 237 – Cool San Diego Sights! Unrestored vintage Silver Line trolley car. Here’s a photo of an unrestored vintage trolley car. It belongs to the San Diego trolley and one day will run on downtown’s Silver Line loop! One vintage car has already been beautifully restored and is running during special hours. I’ll try to get a good pic of it one of these days. Five cars are scheduled for restoration. They are relatively elegant post-war Presidents Conference Committee (PCC) cars, which ran in the city until 1949. Some would like to see these revitalized cars run up a new trolley line from downtown along Park Boulevard to the San Diego Zoo and beyond. It makes sense to me. Balboa Park and the zoo would be more easily reached by out-of-town visitors. Streetcars have been a part of San Diego history since the 1890’s. The first were open-air coaches pulled by mules and horses. Eventually, electric streetcars ran from downtown to Hillcrest and east through many local communities, including North Park, Kensington and East San Diego. With the rise of the motorcar, they vanished. That is, until the modern red trolleys began service in 1981. This photograph was taken at the 12th and Imperial trolley station, right next to the train and MTS trolley yard. You can see the tall bayside Hilton hotel in the background. Posted on September 21, 2013 Tags cool, downtown, history, nostalgia, san diego, san diego trolley, silver line, trains, transportation, trolley1 Comment on Unrestored vintage Silver Line trolley car. Marvel Agents of S.H.I.E.L.D. Comic-Con trolley. 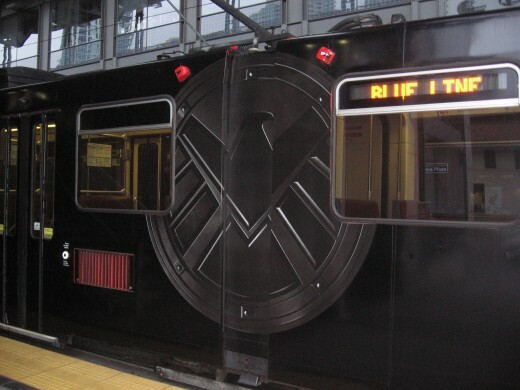 At least one car being used by the San Diego Trolley still has its 2013 Comic-Con Agents of S.H.I.E.L.D. wrap and here it is in this quick photograph. I snapped this seconds after getting off at the Fifth Avenue trolley station. During Comic-Con, I noted three cars had this wrap, plus I saw various other cool wraps promoting other pop culture television shows. Check out the Cool San Diego Sights blog next summer and I’ll try to get a ton of Comic-Con pics. Close-up image of the S.H.I.E.L.D. emblem on a black trolley. Posted on September 21, 2013 July 3, 2015 Tags agents of s.h.i.e.l.d., comic-con, cool, marvel, pop culture, san diego, san diego trolley, television, transportation, trolleyLeave a comment on Marvel Agents of S.H.I.E.L.D. Comic-Con trolley. A pile of cute teddy bears in a downtown window! Here’s another fun pic taken during a recent walk down B Street. A law enforcement teddy bear collection drive has filled several windows of the downtown Merrill Lynch building with warm fuzzy cuddly cuteness! I’m guessing that some less fortunate kids in San Diego are in for a bit of unexpected love! Posted on September 20, 2013 Tags charity, cute, downtown, fun, kids, love, san diego, teddy bears, toys, walkingLeave a comment on A pile of cute teddy bears in a downtown window! Downtown Donut Bar’s window of treats! While walking to the Fifth Avenue trolley station yesterday morning, I passed the window of the Donut Bar on B Street. They’d just filled it with the day’s freshly-baked yummy treats and were preparing to open for business. I almost began to drool right there on the sidewalk! The Donut Bar is frequently listed as one of the top doughnut shops in the entire country! Wow! Thought you’d like to have a peek! Good morning! Oh no! The Donut Bar is Sold Out! Look at this bonus pic! 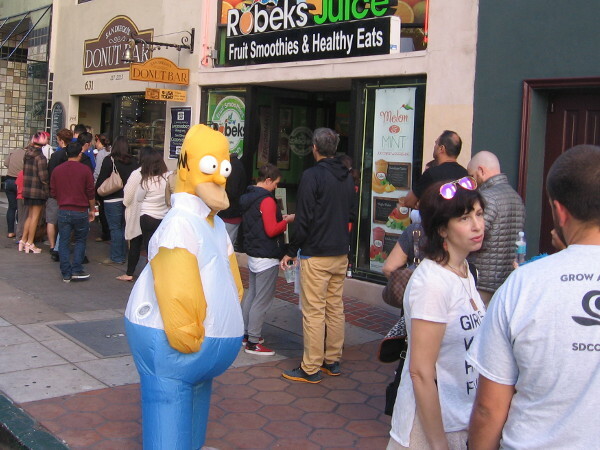 Homer Simpson was out greeting a long line of Donut Bar customers one Saturday morning! 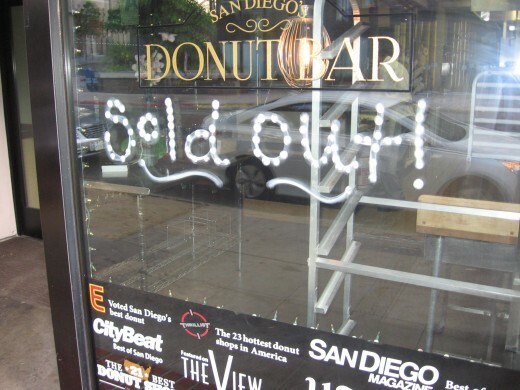 Posted on September 20, 2013 November 15, 2015 Tags baking, business, cooking, donuts, downtown, food, san diego, shops, treats, walkingLeave a comment on Downtown Donut Bar’s window of treats! 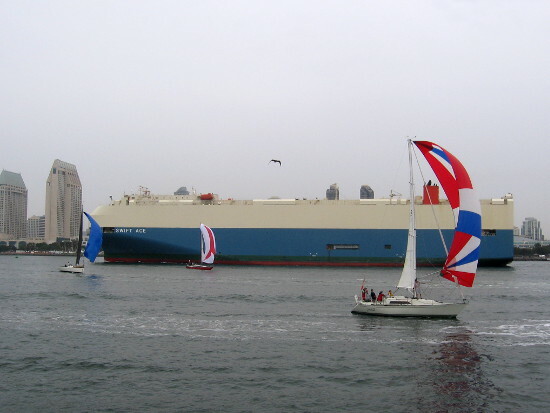 Cool car carrier ship in San Diego Bay. Check out the Lyra Leader, a massive box-like car-carrying ship as it heads down San Diego Bay toward the National City Marine Terminal. These cool, very unusual type of roll-on/roll-off (RORO) ships are often seen passing close to downtown. They’re bringing in thousands of new cars from Asia–Japan and South Korea–which are driven off a ramp into a massive parking lot. Many of the vehicles are then loaded into car-carrying freight trains and sent off toward their final destinations. In this photograph, note the active aircraft carrier USS Carl Vinson docked at the North Island naval base on the left. UPDATE–I finally got a couple more pics of another ship while I was crossing San Diego Bay on the ferry. All the passengers were excited to be so close to the massive thing! Sailboats, skyscrapers and one super enormous ship! 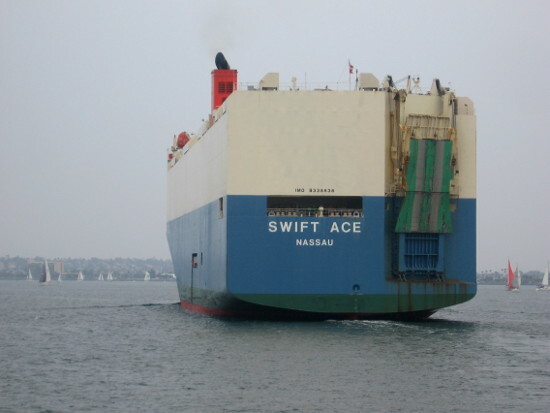 Swift Ace car transport ship leaves San Diego Bay. Posted on September 19, 2013 July 4, 2017 Tags aircraft carriers, cars, cool, national city, north island, port of san diego, san diego, san diego bay, ships, transportationLeave a comment on Cool car carrier ship in San Diego Bay. Merchant seamen memorial plaque in San Diego. 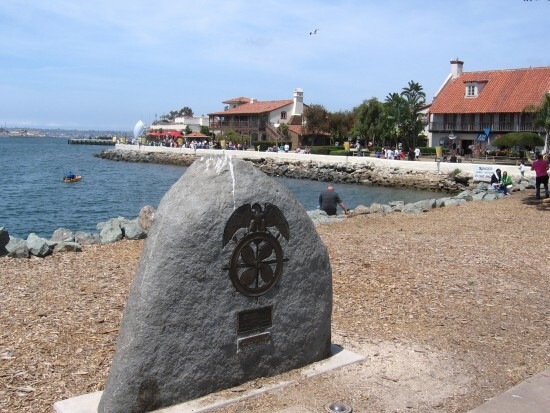 This plaque, a memorial to our nation’s merchant seamen, is located in San Diego’s Embarcadero Marina Park North between a popular walking path and the edge of the big bay. You’ll find it just steps from Seaport Village. Seaport Village behind merchant seamen memorial. Posted on September 19, 2013 April 25, 2014 Tags embarcadero, history, merchant marine, monuments, port of san diego, sailors, san diego, san diego bay, seaport village, walkingLeave a comment on Merchant seamen memorial plaque in San Diego. Watch commercial fishermen unload their catch. 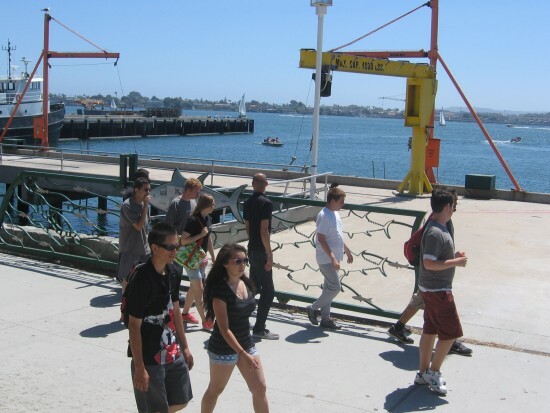 People walk down San Diego’s Embarcadero. 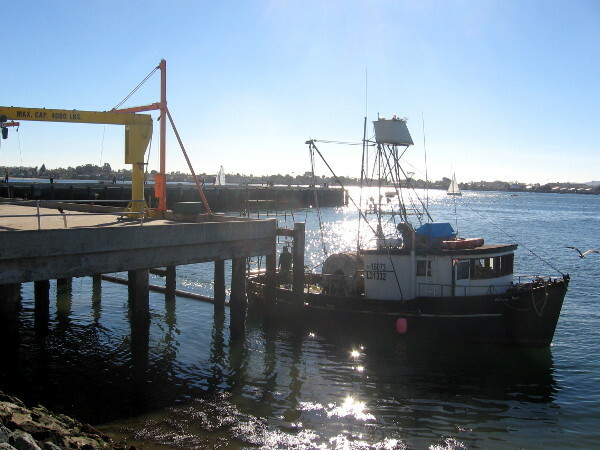 A great place to watch small commercial fishermen unload their catch or load up with ice is the dock just north of Seaport Village, opposite the Chesapeake Fish Company. Folks walking past can also peer through a glass window nearby and see workers in a refrigerated room cleaning and processing the fresh fish that ends up at restaurants throughout the region. I once heard the Chesapeake Fish Company is the largest fish broker west of the Mississippi. 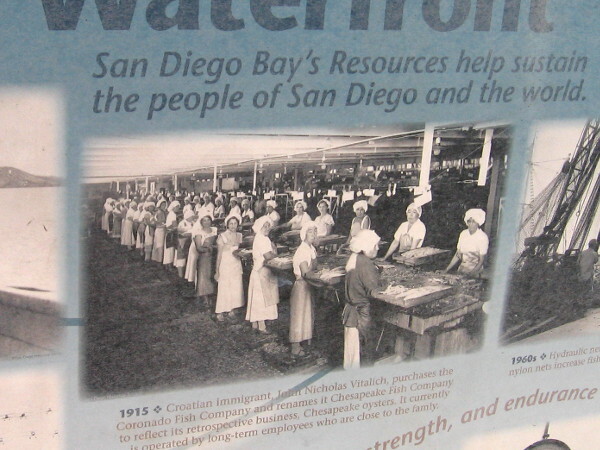 The sign in this photograph details the history of San Diego’s fishing industry–tuna fishing and canning in particular. At one time San Diego had the largest tuna fishing fleet in the world. Many of the fishermen were Italian migrants, which gave rise to the Little Italy neighborhood, about a mile to the north on downtown’s waterfront. Tuna Harbor, adjacent to this dock, now is home to a ragtag group of local fishing boats. It’s also a great place to spot sea lions! 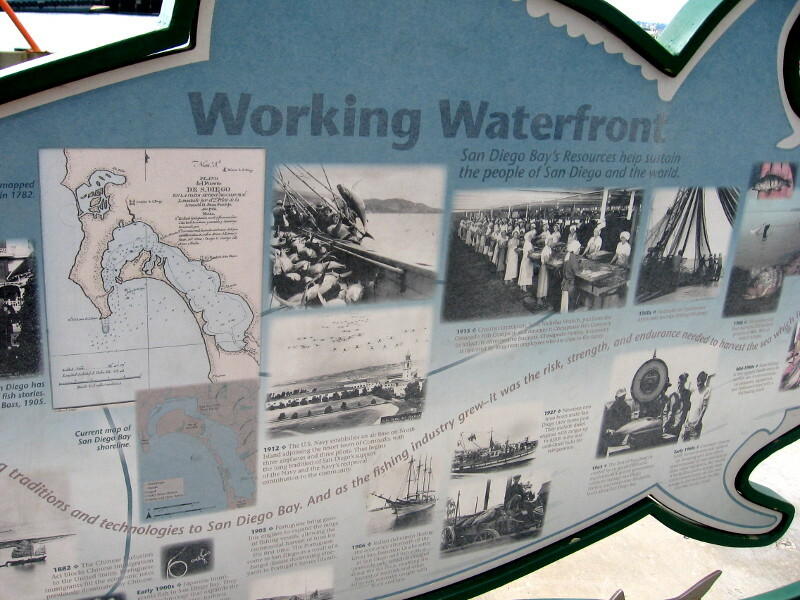 Working Waterfront sign shows photographs from San Diego’s rich fishing history. 1915 photo shows immigrants cleaning and canning locally caught fish. 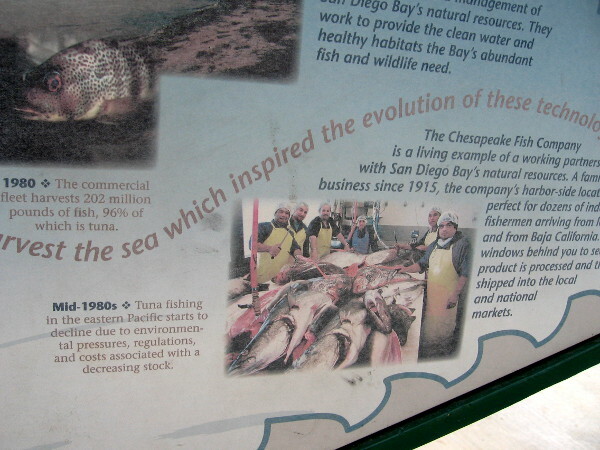 Sign contrasts abundant catch of 1980 with the decline of tuna fishing in mid 80’s. Fishing boat passes by the dock and crane. Posted on September 18, 2013 December 4, 2017 Tags embarcadero, fish, fishing, history, little italy, san diego, san diego bay, seaport village, tuna harbor, walkingLeave a comment on Watch commercial fishermen unload their catch.